Etiquette Pictures announced their second film Blu-ray/DVD Combo Pack film restoration this past week … and it is a doozy! There was this landmark movie that was released theatrically during the summer of 1969 that crushed all expectations and set in motion a Hollywood frenzy to catch the crest of the wave of the “youth” market. 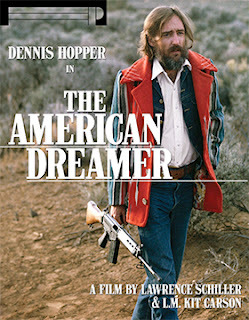 The film was Easy Rider, co-written by Dennis Hopper — who also directed — Peter Fonda and Terry Southern. It starred Hopper and Fonda, along with Jack Nicholson (his first Oscar nomination) … and the film made them all famous (they were all nominated for Oscars). It opened doors and Dennis Hopper, who was no dummy and had been knocking around the business for a decade and half (roles in Rebel Without a Cause, Giant, Gunfight at the O.K. Corral, etc. ), quickly cut a deal with Universal Studios to write and direct his next movie, which was titled The Last Movie. The powers that be back then at Universal could see nothing but dollar signs, and like United Artists a decade later — when they gave Michael Cimino (fresh from The Deer Hunter) the greenlight for Heaven’s Gate — would come to regret their decision. The Last Movie was at best “avant-garde” and at worst, a career-killer. 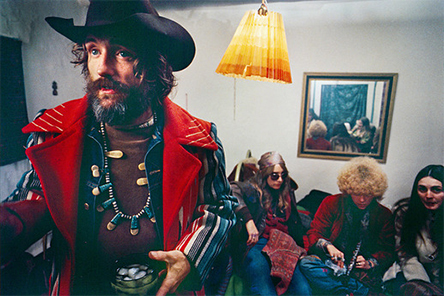 Basically, Dennis Hopper was given a million dollars to go down to South America, with his friends, and shoot a staggering amount of footage … and they all had a good time. That was weird, but when he returned to the United States to edit the film, that’s when it got really weird. L. M. (Lewis Minor) “Kit” Carson and Lawrence Schiller showed up at Hopper’s remote ranch in Taos, New Mexico and proceeded to film footage of the actor — and his entourage — as he struggled to complete the post-production on the film. The result was the documentary, The American Dreamer. It screened as a companion piece to The Last Movie on college campus back in the 1970s and then largely vanished (bootleg copies to be sure) This is what Etiquette Films has ready for everyone to enjoy on Sept. 22 as a Blu-ray/DVD Combo Pack — fully restored!!! Can you imagine if documentary filmmakers were given full access to the creative process of Star Wars, Jaws, The Godfather and on and on. What a treasure trove of film lore The American Dreamer turned out to be … an unbridled insight into an actor, director and writer who has become unhinged. For next six years Dennis Hopper’s career was a drug and alcohol induced black hole. It was over and you can see why. 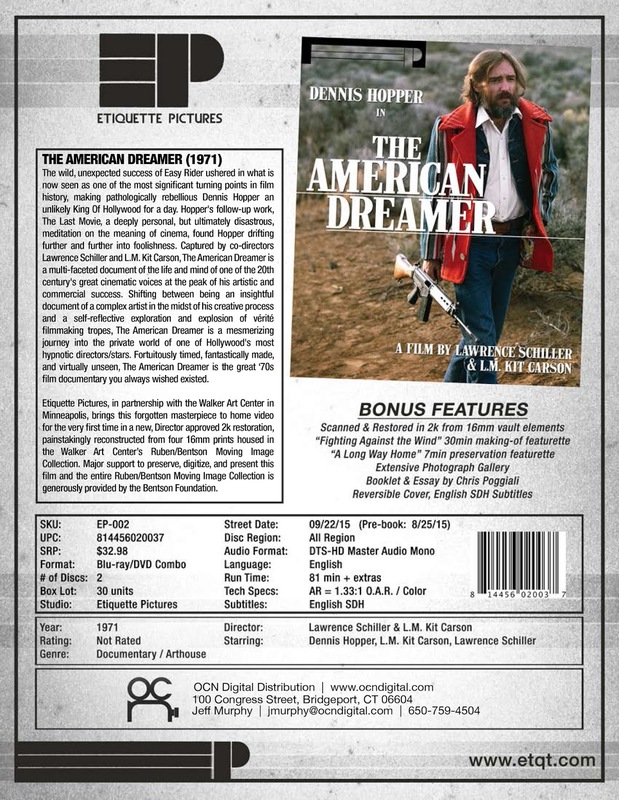 Bonus features for this cinematic treasure include the making-of featurette titled “Fighting Against the Wind” and a look at the preservation process in the featurette titled “A Long Way Home.” There is also a photo gallery and essay booklet prepared by “Temple of Schlock” blogger, Chris Poggiali. The headlines blazed away about the controversy of the Miss U.S.A. Beauty Pageant when Donald Trump ran his mouth off about this or that — rat-a-tat-tat Trump — and the millions of dollars that were at stake after his caustic remarks rubbed some the wrong way. It is a serious business this business of beauty. 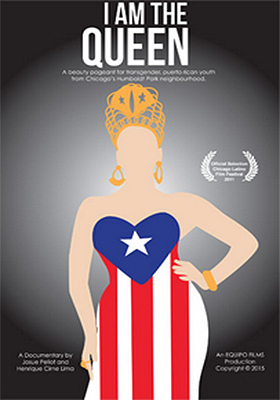 While the Miss U.S.A. Beauty Pageant is a big, big business — a cultural broadcast event — way at the other end of the spectrum, but no less important for those who participate, is the story of a very particular beauty pageant that is the subject of filmmakers Josue Pellot and Henrique Cirne-Lima’s I Am the Queen. Cinema Libre announced this past week that I Am the Queen will be available on DVD beginning Oct. 6. The film focuses on a segment of a small population, beauty pageant participants from the transgender community, but Pellot and Cirne-Lima slice it even smaller with their surprisingly thoughtful look at Chicago’s Puerto Rican T-girl community and the annual Cacique Pageant. Four of the contenders become the focus of their film — Julissa, Bianca, Jolizza and Alayna — as they recount their life experiences, which are often contentious when it comes to acceptance by their own families. Just getting to the grand night of Cacique Pageant takes courage as pressures mount and some of the would-be beauty queens find the road to this competition just too much to bear. In addition to the lead-up to the competition — and the competition itself — the filmmakers also provide insights from a former winner, Jade, and the pageant’s host and producer, Ginger Valdez. I Am the Queen, in lesser hands, could have easily emerged as a “freak show,” but the final product is less about the competition and more about the lives, hopes, struggles and dreams of those who have the courage to compete. By film’s end you cannot help finding yourself fully invested in these human beings. 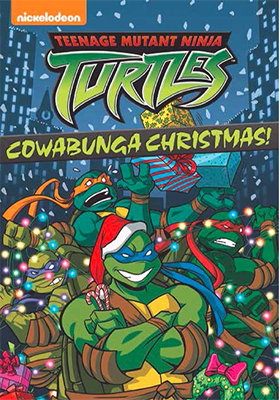 Paramount Home Media has expanded its October release slate with news that Leonardo, Michelangelo, Raphael and Donatello — better known as Nina Turtles — will be seeing their next DVD edition released on Oct. 13. The title is Teenage Mutant Ninja Turtles: Cowabunga Christmas and it features three classic adventures. Also on the Oct. 13 DVD release calendar is Dexter: The Complete Series. All 96 episodes are spread over a massive 32 disc set!!! Not exactly a “seismic shift” — no damage reported in either Los Angeles or San Francisco — but Warner Bros. Home Entertainment announced this past week that director Brad Peyton’s summer blockbuster, San Andreas, has been jolted from Oct. 20 to Oct. 13. 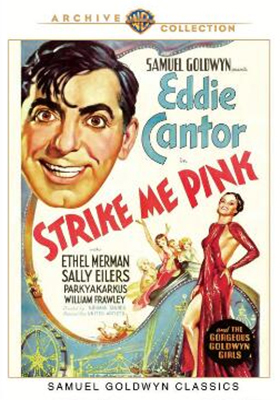 In other release news this week from Warner Bros., they’ve gone to the film vaults and dusted off not one, but four Eddie Cantor films for delivery to DVD on Aug. 4. 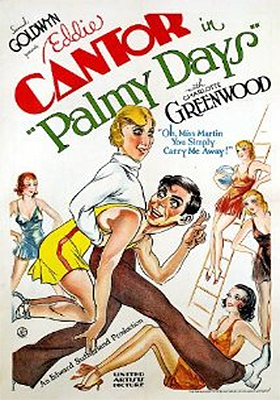 We kick off the fun with Cantor’s second sound film, the 1931 release of director Edward Sutherland’s Palmy Days. Cantor sings and Cantor is funny (especially in a certain “little” outfit) as the assistant to Charles Middleton, the future Flash Gordon iconic villain, Ming the Merciless. Always the bad guy, Middleton is a conman named Yolando, who turns on his little buddy and orders him rubbed out (yes, that’s a young George Raft). Other future stars on view here include Betty Grable and Paulette Goddard (as Goldwyn Girls). Next in line (chronologically speaking) is the 1932 release of director Leo McCarey’s The Kid From Spain. Here, Eddie hams it up with Robert Young as college students — expelled for hanky panky in the girl’s dorm — who get mixed up in a bank robbery and take it on the lam to Mexico. Eddie, to hide from the pursuing police, takes on the perfect disguise … a bull fighter!!! The following year, Eddie Cantor returned with the hit comedy Roman Scandals. Directed film noir gems, This Gun for Hire in 1942) and choreographed by the legendary Busby Berkeley, Eddie is “magically” transported to ancient Rome where he lives out his fantasies with the Princess Sylvia (Gloria Stuart — yes, that Gloria Stuart who played the older Rose in Titanic) and the intrigues of Emperor Valerius (Edward Arnold). The fourth Eddie Cantor film being released on DVD on Aug. 4 is director Norman Taurog’s 1936 musical comedy, Strike Me Pink. Eddie is hired to run an amusement park (filmed at the Palisades Amusement Park in New Jersey) that is a front for illegal activities. Ethel Merman is his co-star, a tough-edged honky-tonk singer that Eddie is madly in love with! On the Blu-ray front, four previously released films on DVD will be getting a Blu-ray push on Oct. 6 … these are: Beast from 20,000 Fathoms, Mighty Joe Young, Son of Kong and Them! On June 29, 2002, elements of the North Korean navy came roaring across the “Northern Limit Line” — the boundary in the Yellow Sea established by the United Nations in 1953 — and attacked the South Korean patrol boat, PKM-357. Repeated warnings to turn back were ignored and without warning a pair of DPRK patrol boats charged and opened fire. Thus began the Second Battle of Yeonpyeong! It has been typical of the North Koreans over the years to instigate provocations. But in this case the provocation was designed to rain on celebrations in the south. South Korea was hosting the World Cup and the world was watching … so it was time to mess up their party! This is the backdrop for director Kim Hak-soon’s action-laced Northern Limit Line, due out on DVD and Blu-ray from Well Go USA on Oct. 20. The battle is engaged and we are introduced to the gallant officers and men of the PKM-357 on an early summer’s day as they fought to save their ship. The film is currently in theatrical release, which yields an ARR of 95 days for that Oct. 20 home entertainment date. Domestic ticket sales for this South Korean blockbuster currently stand at $249,918 (and growing). This particular North Korean provocation did not go unanswered, although hit and casualties sustained, the PKM-357 returned fire and was quickly aided by additional naval forces that sent the DPRK patrol boats scurrying home. When the smoke cleared, it was six dead for South Korea, 13 dead for the north and the World Cup was a resounding success! 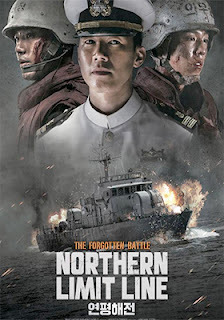 Northern Limit Line is presented in Korean with English subtitles. Icarus Films has selected Sept. 29 as the street date for the eight-disc DVD collection titled Five Films by Patricio Guzmán. 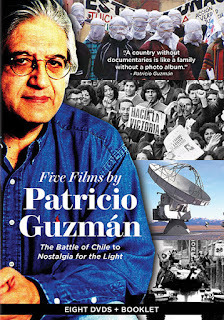 Chilean documentary filmmaker Patricio Guzmán’s works will be celebrated with this award-winning collection that features The Battle of Chile, Part 1 (1975), Part 2 (1977) and Part 3 (1979), Chile, the Obstinate Memory (1997), The Pinochet Case (2001), Salvador Allende (2004) and Nostalgia for the Light (2010). As a bonus, Icarus Films is including in this collection the feature-length documentary from filmmaker Boris Nicot’s Filming Obstinately, Meeting Patricio Guzmán. 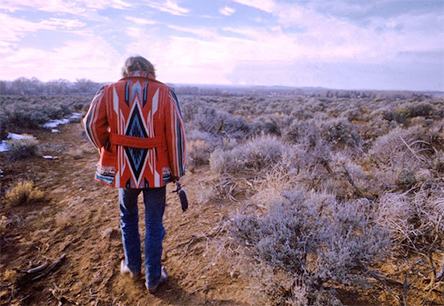 Guzmán candidly discusses his films from the past 40 years. Five Films by Patricio Guzmán is presented in Spanish with English subtitles.